#Farming Friday 24: Would You Want To Be A Farmer? Across the globe there is concern over the greying and emptying of the farming landscape. Younger people leave for cities to look for better paying opportunities and easier working conditions. When people bemoan the loss of the family farm (never mind that family farms are still the norm in most parts of the world as well as in the US), they often do not focus on the reality of working on a farm, that it is hard work without holidays in often uncertain weather conditions, with modest returns; and sometimes not even that, leading to the high incidence of farmer indebtedness in some countries. So what is the solution for rice farms in Japan where the farmers are well into their 70s and 80s? If 20 year olds do not perceive farming as a viable option, could private companies provide the answer? All of us, worrying over our produce, counting the calories, searching for possible gluten in everything, need to know what it takes to grow our food. 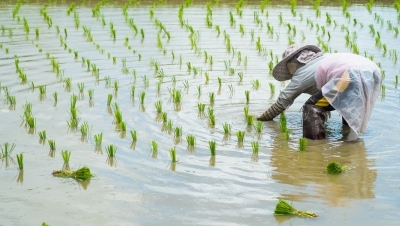 This piece in the Huffington Post seemed to do just that, explaining what it takes to grow rice. I used to think that this is what the food debate needed, a clear look at the production of food rather than the obsession with the plate. But the last line of that piece implying that just reading about growing rice is so exhausting that you need a hot bowl of rice to feel restored leaves me unconvinced.